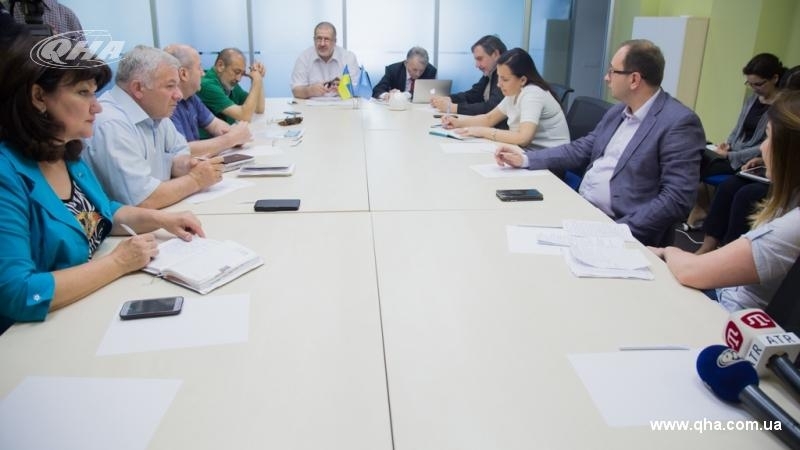 On July 1, a regular meeting of the Mejlis of the Crimean Tatar People was held in Kiev. The wife of the Deputy Chairman of the Mejlis of the Crimean Tatar People Akhtem Chiyhoz Elmira Ablyalimova took part in this meeting. The Chairman of the Mejlis of the Crimean Tatar People Refat Chubarov, the leader of the Crimean Tatar people, the Commissioner of the President of Ukraine for the Affairs of Crimean Tatars Mustafa Dzhemilev, the members of the Mejlis Gayana Yuksel, Riza Shevkiev, Abmedjit Suleymanov and Gulnara Bekirova, the member of the Executive Committee of the World Congress of Crimean Tatars, the Head of the Revision Commission of the Kurultai of Crimean Tatar People Ali Ozenbash, the Coordinator of the Crimean Civil Blockade Lenur Islyamov were at the meeting. The spouse of the Deputy Chairman of the Mejlis of the Crimean Tatar people Akhtem Chiyhoz Elmira Ablyalimova and the lawyer of the Crimean Tatars Nikolai Polozov were also invited to the meeting. Two issues were on the agenda: the situation with Crimean Tatars political prisoners in the Crimea, and changes in the Constitution of Ukraine for creating the Crimean Tatar national-territorial autonomy. Elmira Ablyalimova read the Akhtem Chiyhoz’s appeal to the members of the Mejlis. Her husband is in the Simferopol remand prison on the fabricated by occupation authorities accusation on violation of the territorial integrity of the Russian Federation. She stressed that during two and a half years of this prison detention Akhtem-aga remained to be a Deputy Chairman of the Mejlis of the Crimean Tatar People. He is making attempts to help solving problems of Crimean Tatar people even from the prison as far as possible. The Chiyhoz’s wife specified that prisoners and remand prison staff treat him with respect. She reminded that the Crimean Tatars came to court on political processes with danger of being brought to justice by the occupation authorities. They continue to call themselves as indigenous people of Crimea and citizens of Ukraine. Ablyalimova also mentioned the support of Crimean Tatars from Ukrainians in the Crimea. “Akhtem is very proud of our people and of the position that he shows in the courts. Akhtem Chiyhoz consider that this trial is not over him but over the entire Crimean Tatar people and is continue of the national struggle. People are not afraid to say in the courts that Refat-aga and Mustafa-aga are their leaders, and that the Mejlis is the authority that they have chosen... Akhtem asked to tell that the Crimean Tatars in the mainland Ukraine had to think every day what they had made for our people in the Crimea”, Elmira Ablyalimova added. Referance: Akhtem Chyihoz was detained in January 2015 in the Crimea, on accusations of organizing and participating in mass riots on February 26, 2014. Then, outside the building of the Supreme Council of Crimea, a rally was held in support of the territorial integrity of Ukraine.